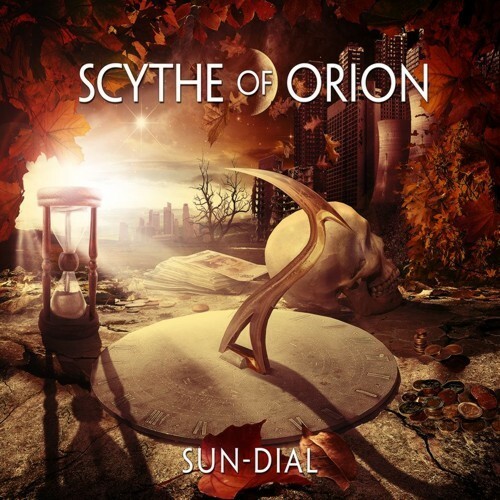 Scythe Of Orion is a Finnish progressive metal act formed in 2006. They released a single in 2007 and then an EP in 2009. Although they have been working years on their first album, the actual recording took only nine days. This first full effort entitled ‘Sun Dial’ tells about the values in today’s world covering greed, the use of power and the state of nature. There is one of those short atmospheric intros with gothic piano and echoed wails before the first main track ‘Ice Soldiers’. The progression from the guitar has some crunch but nothing overtly heavy and the other parts help compliment it nicely. The richness of the keys and strings particularly captivate. ‘Catch My Dreams’ is a mash up of prog metal and pop music. The verse has soft singing as the guitar grinds and the keys soar behind. Suddenly the chorus explodes with a melody that bears a similarity to ABBA and ‘SOS’. This makes for one of the catchiest songs on the album. The likes Of ‘Power Invested In Money’ and ‘The Town’ are faster paced and heavier with something of a gallop about them. The guitar has plenty of gusto and forms the driving force for the songs. ‘Listen My Friend’ offers a classic opening then rest of the band joins in building to a very infectious chorus. The deep chugging riff along with the keys melody helps make this a real stand out. The album closes with two ballad-like songs and another instrumental. ‘Now And Forever’ has more of a folk slant with the acoustic guitar and string players whilst ‘The Storm’ is more of a power chord type ballad with changeable pace. There have been some strong and interesting albums coming out of Finland; Sun Dial joins that list. It’s a beautiful release of multiple influences that have been well meshed into a unique sound but it takes several plays to get what it is all about. Without doubt progressive but borderline metal as it’s melodic and never particularly heavy so could easily be classed as hard rock. Obviously given such a compilation of sounds it’s difficult to give a proper comparison but think the likes of Yes crossed with Lyriel and a little ABBA. Petri Lamminsaari provides some quality riffs and some beautiful acoustic work whilst keyboardist Kristian Wrang helps all these styles melt together. Up front Anu Lamminsaari is not a power singer; her style is more sultry, haunting and expressive. The production is first class and polished but manages to retain a little crispness. Despite this being a lovely release it will definitely be a marmite album, as is often the case with prog; you’ll either love or hate it. Those that prefer music straight up and uncomplicated might find this a bit unconventional. But if an alternative approach agrees with you then this album will resonate well. There are a lot of things to find and appreciate on this classy record.